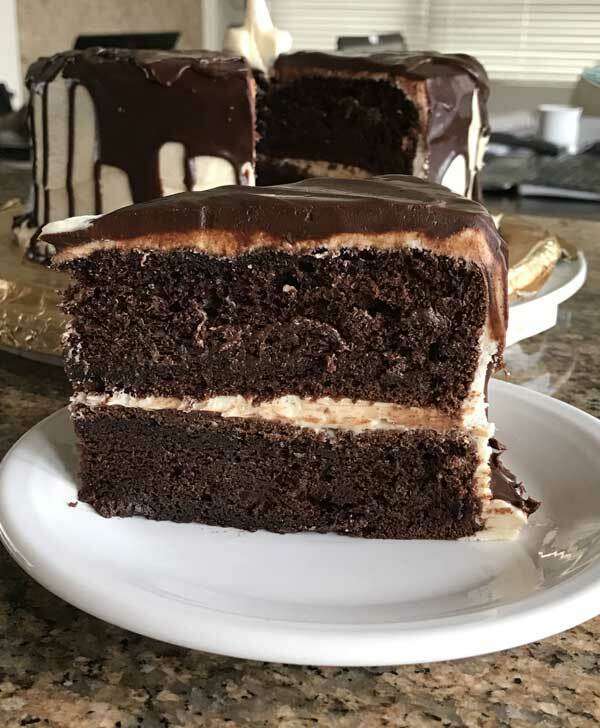 This recipe was originally Chocolate Irish Cream Cake, but it was made with an 18.25 oz boxes of cake mix and since then the amount of cake mix in a box has changed. Given that, I’m sharing a newer recipe from Betty Crocker — one that calls for a 15.25 oz box of cake mix. It’s called Irish Celebration Cake and it is fantastic! Here’s a link to the original Irish Cream Celebration Cake in case you want to read all the reviews. 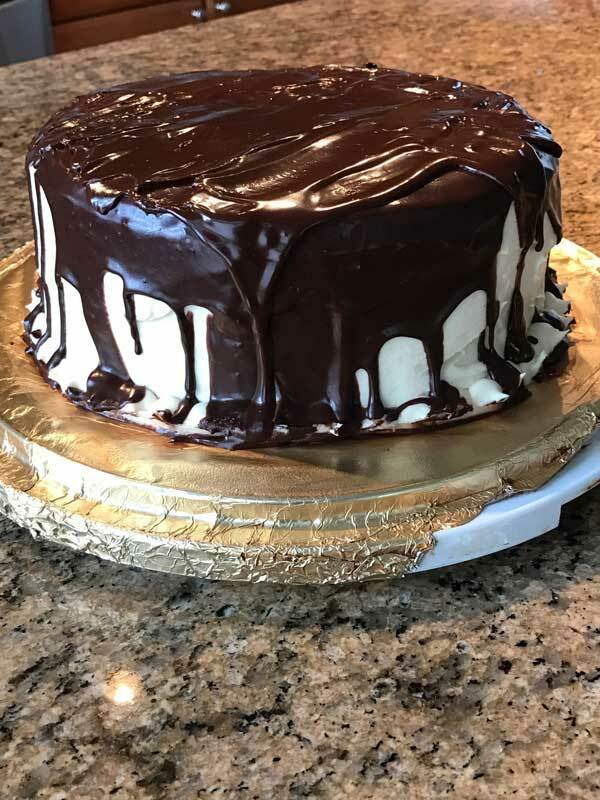 It’s an Irish cream enhanced Devil’s Food cake with an Irish cream flavored icing and a ganache style topping drizzle. I opted to do a pour so it would like like one of those tuxedo style of fudge topped cakes, but I poured a little too soon and things got messy. Next time I’ll stick with the drizzle. 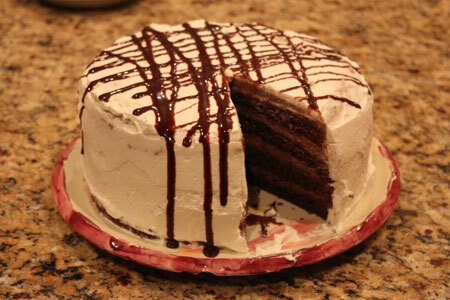 Chocolate Irish Cream Celebration Cake is a chocolate Irish cream cake with a drizzle of chocolate ganache over the top. Preheat oven to 350 degrees F. Spray 2 9-inch round cake pans with flour-added baking spray or just grease and flour as usual. Combine all cake ingredients in a large bowl and beat at medium mixer speed for 2 minutes, scraping sides of bowl. When thoroughly mixed, pour into prepared pans. Bake for 35 minutes or until cakes spring back when touched. Do not over-bake. They will rise quite a bit in the oven, then sink back down as they bake, so they should be flat. Let cool in pans 10 minutes on wire rack. Remove from pans and finish cooling on racks. In large bowl, beat butter and cream cheese with electric mixer on medium speed until light and fluffy. Reduce mixer speed and gradually add powdered sugar, 1 cup at a time, beating until blended. Add Irish Cream and vanilla; beat until frosting is smooth and spreadable. Spread icing between and on top of cake layers, then frost all over. Chill cake while you make the glaze. Put the chopped chocolate in a bowl. In a saucepan, heat whipping cream over medium until it begins to simmer. Pour warm cream over chocolate; let stand 1 minute then whisk until chocolate is melted and mixture is smooth. Add corn syrup and 2 teaspoons vanilla, stirring until smooth. Let stand 10 minutes or until thickened. Drizzle glaze over cake (or dump it over the top like I did). Garnish with almonds if desired. This is a picture of the old Chocolate Irish Cream Cake. If you want to try making it with smaller size boxes (15.25 oz as opposed to 18.25 oz) of cake mix or just want to use the filling, here’s a link to the original recipe with more photos. I made this cake yesterday, it was amazing!! I put up the recipe and pictures at chewywaffles.blogspot.com if you want to see how it looks!! My husband totally was willing to go to the store for Irish Cream and chocolate pudding after seeing this. This looks SOOOOOO good!